As we saw in a previous post, a BBC News website article uncritically amplified the findings of a UN Human Right Council inquiry into the ‘Great Return March’ while portraying violent rioting as “protests”, failing to explain the aim of the demand for ‘right of return’, refraining from noting the long-standing UNHRC bias against Israel, failing to clarify the inbuilt bias of the inquiry’s mandate, ignoring the fact that a significant proportion of those killed in the violent rioting have been shown to be linked to terror groups and promoting the false notion that under-18s, paramedics and journalists are exclusively ‘civilians’. Listeners to BBC Radio 4 also heard reports on the same story – but were they any better? In addition to failing to clarify that the report was commissioned by the partisan UNHRC, that portrayal once again frames violent rioting as “demonstrations” and the people taking part as “protesters”. As in the BBC’s written report, the investigators were blindly quoted with no clarification of the fact that some of those “children and people clearly marked as journalists and medics” have been shown to have links to terror groups. Later on in the same programme (from 20:35), presenter James Coomarasamy interviewed one of the report’s authors in relation to what he began by describing as “a highly critical report by the Human Rights Council”. Coomarasamy did not clarify to listeners that none of the report’s three authors have any expertise in military operations. Coomarasamy failed to challenge Hossein’s absurd claim of a distinction between ‘political’ Hamas and its ‘armed wing’. Later on in the interview (23:50) Coomarasamy did raise the topic of UNHRC institutional bias against Israel but despite acknowledgement of that issue by former UN officials, presented it using the BBC’s favoured ‘Israel says’ formula. Rather than informing listeners of the numerous cases in which under-18s, journalists and paramedics have been shown to have links to terror organisations and asking Hossein why the commission ignored Hamas’ own statements regarding the affiliations of many of the dead, Coomarasamy closed the conversation there. That crucial omission was likewise relevant in Coomarasamy’s subsequent interview with Israel’s representative at the UN in Geneva, Aviva Raz Shechter. During that conversation Coomarasamy repeatedly promoted the UNHRC’s talking points. As we see, Coomarasamy promoted the absurd notion that minors, people with disabilities (the UNHRC report includes one example of a deaf person, though how IDF forces were supposed to know that is not made clear), paramedics or people wearing ‘Press’ vests are automatically “innocent civilians” regardless of their affiliations or actions at the time. Previously the same day Radio 4 listeners had heard another dose of unchallenged UNHRC messaging – although significantly, that body was not mentioned by name – in the ‘World at One’ news bulletin (from 05:14 here). Once again we see uncritical and unquestioning amplification of the UNHRC report, including the term “war crimes” which, as NGO Monitor explains, is inapplicable given the legal framework selected by the commission. BBC coverage of the ‘Great Return March’ has been highly unsatisfactory over the past eleven months, meaning that audiences come to this latest story without the background information necessary for its proper understanding. As we see, rather than try to make up for the serial failure to clarify that what it uniformly portrays as “protests” and “demonstrations” is actually violent rioting which has included hundreds of petrol bomb attacks, IED attacks, grenade attacks and shooting attacks as well as infiltration attempts, the BBC elected to unquestioningly amplify the UNHRC report which dovetails with its own existing politically motivated narrative. “Israeli soldiers may have committed war crimes while responding to Palestinian protests on the Gaza border last year, UN human rights experts have said. A commission of inquiry investigated the killing of 189 Palestinians between 30 March and 31 December 2018. It found reasonable grounds to believe that Israeli snipers shot at children, medics and journalists, even though they were clearly recognisable as such. As has been documented here over the past eleven months, the BBC’s reporting on the ‘Great Return March’ violent rioting has uniformly portrayed the events as “protests” and “demonstrations” and has repeatedly downplayed or erased their violent nature. This latest report continued that framing. As has been the case in previous BBC reporting, no explanation of the significance of that “declared right” and the fact that the aim of that demand is to threaten the existence of Israel as the Jewish state was provided to readers. Over the past eleven months we have also repeatedly documented the fact that the BBC has downplayed or erased Hamas’ role in initiating, organising and facilitating the ‘Great Return March’ violent rioting along the border between Israel and the Gaza Strip. In this report, however, the BBC had no choice but reflect the UNHRC’s acknowledgement of Hamas’ role. Hamas is of course also designated as a terrorist group in whole or in part by additional countries and bodies including the EU, the US, Australia, New Zealand, the UK, Japan and Canada. Obviously this report could not be complete without provision of an overview of both the UNHRC’s longstanding anti-Israel bias and the one-sided mandate of the specific ‘investigation’ which led to the publication of the report which is its subject matter. The BBC however failed to provide readers with that crucial information. “The commission of inquiry, which was set up by the UN Human Rights Council in May, said on Thursday that more than 6,000 unarmed demonstrators were shot by military snipers at designated protest sites over nine months. The BBC’s article made no effort to explain to audiences that the fact that some of the fatalities were children or “clearly marked paramedics” or “clearly marked journalists” does not exclude the possibility of links to terror organisations. For example in May 2018 the BBC published a report in which it was claimed that “one paramedic was killed and several others were wounded on Monday as Israeli troops opened fire during the protests.” That same paramedic appeared in a poster released by Hamas showing some of its members killed on May 14th. Among the under-18s killed were those with direct links to Hamas who were sent to sabotage the border fence while others – such as Ahmad al-Sha’ar [also al Shaer] who is named on page 9 of the UNHRC report – were terror operatives (see page 20 here). In fact around 80% of those killed during the ‘Great Return March’ have been shown to be affiliated with terror factions – a fact totally ignored by the BBC in its unquestioning amplification of this UNHRC report. Thus BBC audiences were denied the ability to judge for themselves the UNHRC’s preposterous claim that the violent rioting is “civilian in nature”. Why did the BBC News website erase an accurate statement? The first item began (from 37:13 here) with an opaque reference to a new political party running in the upcoming general election in Israel – but without listeners being told even the party leader’s name – and yet more euphemistic portrayal of the ‘Great Return March’ violent rioting as “protests”. As BBC reporting on past Israeli elections shows, the corporation has repeatedly promoted the notion that the ‘peace process’ was the most important issue facing the Israeli electorate even when that was patently not the case. Bateman began by airbrushing Hamas’ violent take-over of the Gaza Strip nearly 12 years ago and whitewashing the background to “the conflict between Israel and Hamas”. Failing to clarify that “the health ministry in Gaza” is the same terror group behind the weekly violent rioting at the border, Bateman went on to make a context-free reference to an earlier incident. Bateman failed to inform listeners that those “civil servants” are employees of the Hamas terror organisation or that the reason for the postponement of that “third payment” was a rise in violence that included more rocket attacks that went unreported by the BBC. While the BBC has not yet produced much reporting on the upcoming election in Israel its framing of that topic so far is just as inflexible and unhelpful to audiences as its framing of almost ten months of weekly violent rioting and border infiltrations which it persists in portraying as “protests”. A significant proportion of the January 18th edition of BBC Radio 4’s ‘Today’ programme was given over to what appears to have become one of its presenters’ pet topic – the Gaza Strip. The previous evening viewers of ‘News at Ten’ had seen Mishal Husain’s one-sided report on the healthcare system in Gaza – filmed a month earlier when she visited the territory – and the next morning Radio 4 listeners heard her present a total of over sixteen and a half minutes of similar content in two separate items. Those two items will be discussed in upcoming posts but first let’s take a look at statements made by Mishal Husain near the beginning of both those items – from 37:13 and 2:09:59 here. First let’s examine the source of that information. Although Husain uses the terms “UN” and “United Nations”, the data specifically comes from a press release put out by the local branch of the United Nations Office for the Coordination of Humanitarian Affairs (OCHA) which, as regular readers know, is a highly politicised and partisan organisation that has in the past used highly dubious methodology to produce reports on casualties in the Gaza Strip. And indeed, according to the break-down titled “Injuries by type of weapon” appearing on that data base, the most frequent cause of those injuries is defined as “Tear Gas (inhalation)”. Another point arising from that data – but airbrushed away from audience view by Husain – is UNOCHA’s admittance that some of the casualties were terrorists. “On the day of the violent events that prompted so much BBC coverage – May 14th – the Palestinian Islamic Jihad announced that three of those killed belonged to its terror organisation. The following afternoon – May 15th – Hamas put out a ‘martyrdom poster’ for ten members of its internal security apparatus also killed in the May 14th incidents. On the afternoon of May 16th reports emerged concerning an interview given by Hamas’ Salah Bardawil to a local TV channel. “A Hamas official on Wednesday acknowledged that 50 of the 62 Palestinians reported killed during Gaza border riots on Monday and Tuesday were members of the Islamist terrorist group, bringing the total number of known members of terror groups among the fatalities up to 53. “In the last rounds of confrontations, if 62 people were martyred, Fifty of the martyrs were Hamas and 12 from the people. How can Hamas reap the fruits if it pays such an expensive price?” said Hamas official Salah Bardawil in an interview with the Palestinian Baladna news outlet. Just as the BBC overwhelmingly avoided reporting that information at the time, it continues to have no place in the narrative promoted by Mishal Husain. A report published by the ITIC two days before this Radio 4 broadcast went on air identifies 150 out of 187 Palestinians killed during the ‘Great Return March’ rioting between March 30th 2018 and January 16th 2019 as being linked to terror organisations – i.e. 80%. Of those 150, ninety-six (52%) were affiliated with Hamas and 45 of those (i.e. 24% of all the fatalities) were operatives in Hamas’ military wing. In other words, while encouraging audiences to compare the number of Palestinians killed in “the worst year…since the Gaza conflict of 2014” with the number of Israelis killed “in the same period”, Husain airbrushed away the fact that some of the Palestinians killed were in the process of carrying out the very attacks in which some of those Israelis were murdered and concealed the fact that a high proportion of those killed during the ‘Great Return March’ were affiliated with the terrorist groups that instigated, organised, financed and facilitated that violent rioting. The obviously significant connection between “the worst year for Palestinian deaths and injuries in the West Bank and Gaza since the Gaza conflict of 2014” and the fact that Palestinians chose in 2018 to engage in terrorism and weekly violent mass rioting has of course no place in the politically motivated framing advanced by Mishal Husain. On August 10th the BBC Trust published the findings of a review of the impartiality of the BBC’s reporting of statistics in its news and current affairs output which was commissioned in 2015. The report, together with accompanying documents, is accessible here. Titled “Making Sense of Statistics”, the report makes interesting reading, although it has a somewhat domestic focus. While it does not address the issue of the BBC’s presentation of casualty figures during the 2014 conflict between Israel and Hamas, some of its observations, conclusions and recommendations are pertinent to the corporation’s portrayal of that topic both at the time and since. On page 17, the report addresses the topic of audience expectations. “Audiences expect that numbers are accurate, factual and verified, that claims that are wrong or misleading are challenged, and that a range of evidence is used to put statistical claims into context. In other words, the BBC has to ensure that the public is informed accurately and impartially on the important issues of the day by helping audiences navigate through the statistical evidence and make sense of the numbers. As regular readers know, the BBC did not independently verify the casualty figures and civilian/combatant casualty ratios which it presented to its audiences during the 2014 conflict. Although there is no publicly available evidence of its having carried out any such verification since the conflict ended, it continues to quote and promote unverified data sourced from interested parties and has even defended its own use of statistics provided by a terrorist organisation. Clearly those ‘golden rules’ were not followed when the BBC unquestioningly promoted data provided, via a third-party, by political NGOs engaged in lawfare against Israel. On the one occasion that the BBC did provide its audiences with some good statistical analysis of the topic of casualty figures in August 2014, that article was subsequently altered and reframed to the point of being rendered meaningless. “But by far the most egregious aspect of this BBC feature is the fact that it makes no attempt whatsoever to provide BBC audiences with the crucial context of casualty ratios in the Gaza Strip as compared to those in other conflicts. Let us assume for a moment that the UN figures quoted and promoted by the BBC are correct and that 495 children were killed during Operation Protective Edge and that none of those under 18s (as UNICEF defines child casualties) were in fact operatives for terrorist organisations. Even if we take those figures at face value, the percentage of children killed in the Gaza Strip during the summer of 2014 is, as Ben Dror Yemini has pointed out, considerably lower than the percentage of children killed by coalition forces (including British troops) in Iraq and by NATO forces (also including British troops) in Kosovo. One can only hope that this review will prompt the BBC to take the subject of verification of data originating from political NGOs and terrorist groups much more seriously than it has done in the past and that the focus will from now on be placed on meeting audience expectations of provision of accurate, verified and impartial data rather than the promotion of deliberately politicised statistics. “Israel’s prime minister has denounced a call by Sweden’s foreign minister to investigate whether recent killings of Palestinians were “extrajudicial”. Benjamin Netanyahu said Margot Wallstrom’s remarks were “outrageous… immoral and… stupid”. Ms Wallstrom had called for “thorough and credible investigations” into the deaths. Leaving aside the embarrassingly uninformed nature of Margot Wallström’s latest insinuations about Israel, the remarkable thing about this BBC report is that those reading it have no way of knowing which of the two people quoted – Netanyahu or Wallström – is talking facts. The reason for that is because – as has been noted here previously on numerous occasions – for more than three months the BBC has consistently avoided telling its audiences in its own words that the vast majority of Palestinian casualties during that time were killed whilst carrying out terror attacks or engaged in violent rioting. Instead, BBC reports have invariably used qualifying terms such as “Israel says” or “were said by Israel to be attackers”. The question that therefore arises is does the BBC employ similar qualifying language when covering the shooting of attackers in other countries or is that editorial policy reserved for use when reporting about Israel? In October of 2015 the BBC reported a story from Margot Wallström’s native Sweden. “A masked man armed with a sword has killed a pupil and a teacher at a school in Sweden. The suspect, clad in black, apparently posed for photos with students ahead of the attack, in the western town of Trollhattan. No qualifying “Sweden says” there. No qualifying “said by France to be an attacker” there – and in the BBC’s written report on the incident, Schofield clearly signposted the attack for BBC audiences. So apparently – in contrast to Israel, where the BBC selectively avoids the use of the word ‘terror’, there are no issues surrounding the use of the word when reporting from France. Apparently too, the BBC does not feel the need to portray information supplied by the Swedish and French authorities in qualifying terms which signal to audiences that there is room for doubt as to whether the person shot was actually carrying out an attack. And whilst the BBC obviously finds it appropriate to amplify Margot Wallström’s insinuation that the shooting of terrorists in the act in Israel might be considered “extrajudicial”, in Paris terrorists are “not surprisingly” shot whilst carrying out attacks. 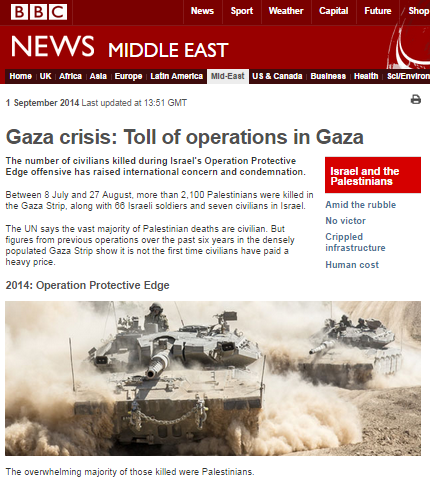 Are BBC News reports on Palestinian deaths accurate and impartial? 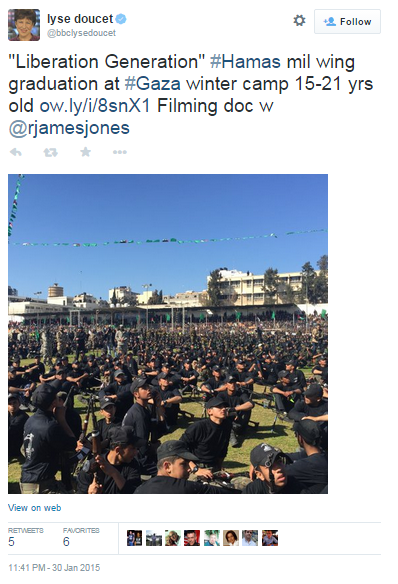 Is a BBC documentary about Hamas’ child soldiers upcoming? The video below shows footage taken at a youth camp for 15 to 21 year-olds recently organized in the Gaza Strip by Hamas’ Izz Al-Din Al-Qassam Brigades. Among the few Western media outlets which reported that story were the Washington Post and the Telegraph. However, a tweet from Lyse Doucet suggests that the BBC is also going to cover the topic at some point. Whether or not this is part of the documentary on children in the Gaza Strip about which Doucet was interviewed by the Guardian last September is not clear. It will however be interesting to see whether the opportunity is used to inform BBC audiences about Hamas’ use of child soldiers – including during the most recent conflict – and whether or not it will be clarified that one of the UN conventions signed by the Palestinian Authority in April 2014 was the Convention on the Rights of the Child on the Involvement of Children in Armed Conflict, according to which no soldier should be under the age of 18. We have previously discussed two aspects of a response received by a reader from the BBC Complaints department here and here. The third (and final, readers will no doubt be relieved to know) part of that response related to the issue of the BBC’s reporting of casualty figures in the Gaza Strip during the recent conflict. “We dispute the suggestion that using numbers provided by the Palestinian Health Ministry in Gaza and the UN on the death toll in Gaza indicates a pro-Palestinian bias. The Health Ministry in Gaza is in touch with all the hospitals in Gaza. The Ministry is where all deaths are registered. It is the key source of information on deaths in the conflict for all news organisations and for other external organisations, including foreign embassies. Israeli authorities simply do not have access to hospitals and morgues in Gaza to provide such reporting. When the BBC reports death tolls they are clearly attributed to the Health Ministry, so the source has been clear in our coverage. Generally, during the conflict the Health Ministry itself did not make claims as to what number of those killed were civilians or combatants. They were collating information coming in from their morgues and passing on quickly to the media a number of times each day. The UN has made claims as to the number of Palestinians killed and the number of those who are civilians. The BBC reports these numbers attributed to the UN which is of course an internationally recognised organisation. 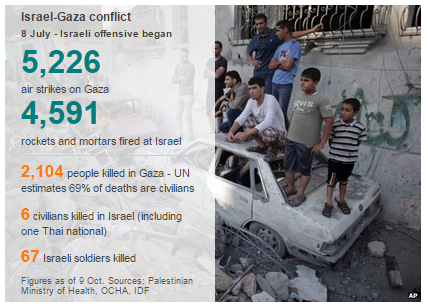 The UN has a large staff in Gaza who compile these reports. The question of who has officials in Gaza collating such reports is important. Some Palestinians were killed by Israeli air strikes when the IDF would have had surveillance of the aftermath of the strike from the air. However, many people have been killed by sustained artillery assault on certain areas which caused death from shrapnel fire, buildings collapsing and other factors. The BBC’s approach to reporting these numbers is common to the rest of the media. The claim that “[w]hen the BBC reports death tolls they are clearly attributed to the Health Ministry, so the source has been clear in our coverage” is true in so far as it goes. However, those reports consistently failed to sufficiently clarify to BBC audiences that “the Health Ministry” is run by the same terrorist organization engaged in conflict with Israel and hence not an impartial or reliable source. The claim that “[g]enerally, during the conflict the Health Ministry itself did not make claims as to what number of those killed were civilians or combatants” avoids recognition of the fact that the Gaza Health Ministry’s policy of identifying all casualties as civilians was a deliberate one designed to influence public opinion. Throughout its reporting on the conflict the BBC refrained from informing audiences of the very relevant issue of the instructions put out by Hamas’ Interior Ministry specifically ordering all parties to describe all casualties as ‘civilians’. The BBC also adopted the Hamas stance according to which all casualties were the result of Israeli actions and consistently ignored issues such as casualties resulting from misfired missiles or booby-trapped buildings. The statement “[t]he UN has made claims as to the number of Palestinians killed and the number of those who are civilians. The BBC reports these numbers attributed to the UN which is of course an internationally recognised organization” clearly indicates that the BBC not only ignores the very relevant topic of the bias of UN bodies themselves, but also the political motivations of the sources of the figures quoted by the UN. As was noted here at the time, UN statistics were compiled from a variety of primary and secondary sources and the BBC’s claim that “[t]he UN has a large staff in Gaza who compile these reports” is not supported by the information BBC Watch received from the UN itself. The statement “[t]he question of who has officials in Gaza collating such reports is important” is undoubtedly true – although not in the manner intended in this response. The fact that the UN relies on local NGOs concurrently engaged in lawfare against Israel is a highly relevant factor in the assessment of the reliability of those claims. Notably, this response completely avoids the topic of the BBC’s failure to independently verify the statistics it quoted and promoted and the fact that at no point did the BBC attempt to put the figures it quoted into their correct context. “The rest of the media”, however, is not bound by the same editorial guidelines on accuracy and impartiality relevant to BBC coverage. The statement “[i]t’s also worth noting that Israel has not provided evidence as to why their figures on civilian casualties differed so significantly from the figures produced by UN officials on the ground in Gaza” is particularly interesting in light of the fact that the BBC has made no such demand for “evidence” from the Hamas Health Ministry or the political NGOs which supply figures to the UN. As the work of the Meir Amit Intelligence and Information Centre has shown, examination of the lists of names provided by those bodies reveals instances in which names were recorded more than once and cases in which the ages of casualties were misrepresented. As ‘Elder of Ziyon’ has demonstrated, many of those described by sources used by the BBC (particularly the PCHR) as ‘civilian casualties’ have turned out to be terrorists. This response from the BBC Complaints department is clearly also unsatisfactory in that it completely fails to acknowledge the very relevant topic of manipulation of civilian casualty figures by Hamas and its supporters as part of their propaganda war aimed at garnering Western public opinion. The BBC’s promotion and amplification of Hamas-supplied figures, its failure to independently verify casualty statistics and civilian/combatant ratios and its documented capitulation to political pressure from interested parties on the topic of casualty figures is all evidence of its adoption of a specific politically motivated narrative. No wonder, therefore, that complaints have been made on this subject but – as is amply clear from the official response above – the self-regulating BBC is incapable of providing an appropriately impartial response to complaints from its funding public, resorting instead to attempted self-justification of its editorial policies. 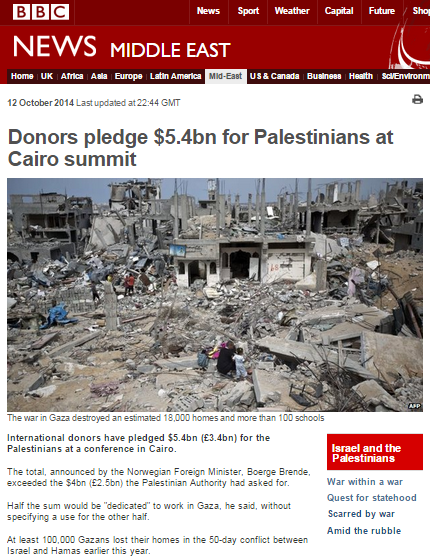 The second of the BBC News website’s reports on last weekend’s donor conference in Cairo was a report currently headlined “Donors pledge $5.4bn for Palestinians at Cairo summit” which underwent numerous changes after its initial appearance on October 12th. The article’s most notable feature is its repeated promotion of a specific theme. “Earlier the Palestinian and Egyptian presidents called on Israel to commit to a long-term peace initiative. “He [John Kerrry] added that anything other than a long-term commitment to peace would be a “band-aid fix”. At the opening of the conference, President Sisi urged “the Israelis, both the people and the government” to put an end to the conflict. “Announcing the UK’s $32m donation in Cairo, International Development Minister Desmond Swayne said the international community could not continue to pick up the pieces of the conflict indefinitely. However, despite the repeated amplification of that theme, at no point in the article does the BBC bother to inform readers that the terrorist organization which still controls the Gaza Strip, which is party to the current PA unity government and to which the incumbent President of the PA has already stated that he will cede control in the event of its victory in the supposedly upcoming elections, not only opposes holding negotiations in order to reach a peace agreement with Israel, but rejects the very existence of the Jewish state. Likewise, the related and highly relevant topic of the failure of the Palestinian unity government to disarm Hamas in accordance with existing agreements with Israel – by which it declared it would stand (and yet failed to do so) when that government was inaugurated in June – is not introduced into this article. “The Gaza Strip, sandwiched between Israel and Egypt, has been a recurring flashpoint in the Israel-Palestinian conflict for years. Israel occupied Gaza in the 1967 Middle East war and pulled its troops and settlers out in 2005. Israel considered this the end of the occupation, though the UN continues to regard Gaza as part of Israeli-occupied Palestinian territory. As we see, the elephant-in-the-room issue of Palestinian terrorism is completely ignored in this account, with the BBC clearly trying to promote the politically motivated myth of an ‘occupation’ of the Gaza Strip which has not existed for nine years. As has been the case on numerous previous occasions, the BBC misleadingly proposes that Israeli control over “Gaza’s borders, waters and airspace” is evidence of continuing ‘occupation’ but deliberately refrains from informing audiences that the representatives of the Palestinian people were party to the creation of that arrangement when they signed the Oslo Accords and further confirmed it when they signed the later Agreement on Movement and Access in November 2005 following Israel’s disengagement from the Gaza Strip. An additional notable factor in this report is its continued promotion of casualty figures which have still not been independently verified by the BBC and with no transparency regarding the partisan nature and political background of their sources. As has been the case in all BBC reports to date, no effort is made to inform audiences of the existence of other estimates of the civilian/combatant casualty ratio in the Gaza Strip. The Meir Amit Intelligence and Terrorism Information Centre, which has so far carried out detailed examination of 42% of the casualties named by Palestinian sources has so far identified 49.8% of those names as terrorists and 50.2% as civilians. Yet again, no attempt is made by the BBC to inform audiences of how the civilian/combatant casualty ratio in Gaza compares to that of other conflicts. This report – ostensibly a news item – once again demonstrates that the BBC’s practical interpretation of its obligation to “[b]uild a global understanding of international issues” is shaped by the political messaging it aspires to promote rather than by any genuine commitment to accurate and impartial reporting of events and the provision of all relevant information which would allow audiences to fully and comprehensively understand the issues at stake. On September 1st the BBC News website published a feature titled “Gaza crisis: Toll of operations in Gaza” which has since become a frequent appendage to numerous other articles published on the website’s Middle East page. As we know, the BBC has stated that its online content is intended to act as “historical records” and hence the accuracy and impartiality of that content is of prime importance. “The number of civilians killed during Israel’s Operation Protective Edge offensive has raised international concern and condemnation. Between 8 July and 27 August, more than 2,100 Palestinians were killed in the Gaza Strip, along with 66 Israeli soldiers and seven civilians in Israel. Once again we see the BBC quoting “the UN” as though that body were impeccably objective, but with no effort made to inform audiences with regard to the very significant issue of the background to those UN statements and the political motivations involved. “The overwhelming majority of those killed were Palestinians. The UN says at least 2,104 Palestinian died, including 1,462 civilians, of whom 495 were children and 253 women. No effort is made to inform BBC audiences, for example, of the ongoing analysis being carried out by the Meir Amit Intelligence and Terrorism Information Centre which, after examination of some 35% of the named casualties, so far indicates that the ratio of combatants to civilians stands at 49% to 51% respectively. The section goes on to present graphics including one complied on the basis of information provided, inter alia, by the Hamas-run Gaza Ministry of Health and “Al Akhbar” – an anti-Israel Lebanese online media organization considered by some to be pro-Hizballah. It further includes ‘analysis’ from the BBC’s head of statistics who – as readers may recall – was forced to radically amend a previous article on the topic of casualties in the Gaza Strip due to outside pressure from politically motivated organisations. 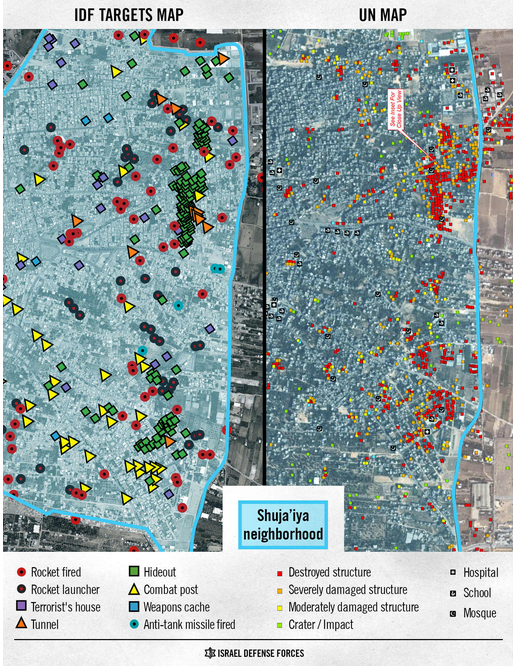 The section goes on to state that “[s]atellite images released by the United Nations show how a section of Shijaia [sic] neighbourhood in Gaza City has been razed by attacks since 8 July” but no attempt is made to provide BBC audiences with the all-important context behind those images by informing them of the military installations deliberately placed by Hamas and other terrorist organisations in that neighbourhood. “Israel’s previous major air strike offensive on Gaza was Operation Pillar of Defense in November 2012. It began with an air strike that killed the commander of Hamas’s military wing, Ahmed Jabari, whom it accused of responsibility for “all terrorist activities against Israel from Gaza” over the past decade. Detailed examination of the names of casualties by the Meir Amit Intelligence and Terrorism Information Centre put the ratio of combatants to civilians at 60:40 compared to B’Tselem’s 52% civilian casualty rate. The section goes on to promote two more politically motivated NGOs and to advance the myth of the use of white phosphorous as a weapon during Operation Cast Lead. “Israel’s military had put the overall Palestinian death toll at 1,166, of whom it said 295 were “uninvolved” civilians. The Palestinian Centre for Human Rights estimates that 1,417 Palestinians died, 926 of whom were civilians. No mention is made of the fact that Hamas’ Fathi Hamad admitted in a 2010 interview that around half the casualties in that operation were terrorists, thus negating the inaccurate claims made by the PCHR still being promoted by the BBC. But by far the most egregious aspect of this BBC feature is the fact that it makes no attempt whatsoever to provide BBC audiences with the crucial context of casualty ratios in the Gaza Strip as compared to those in other conflicts. And even if we take the BBC’s claim that 1,462 (69%) of a total of 2,104 casualties in the Gaza Strip were civilians as being accurate (despite the fact that – as noted above – ongoing analysis suggests that the ratio of civilians to combatants may actually be lower), that would still mean that – as Col. Richard Kemp has pointed out on numerous occasions – there is nothing exceptional about that ratio. “The UN estimate that there has been an average three-to one ratio of civilian to combatant deaths in such conflicts worldwide. Three civilians for every combatant killed. That is the estimated ratio in Afghanistan: three to one. That statement would lead any reasonable reader to believe that the number of civilian casualties in the Gaza Strip during Operation Protective Edge was somehow exceptional enough to prompt “international concern and condemnation”. The BBC’s editorial decision to omit from this feature any comparison to other conflicts means that audiences are unable to put that statement into its correct perspective and are hence likely to be misled. Indeed the price paid by Gaza’s civilian population for the actions of terrorist organisations embedded in their midst is a “heavy” and regrettable one. However – in contrast to the impression this anonymously written feature deliberately attempts to create – it is nevertheless no heavier than that paid by civilian populations in conflict zones elsewhere in the world. The BBC’s decision not to inform its audiences of that fact can only be attributed to political motivations being allowed to trump editorial standards of accuracy and impartiality.